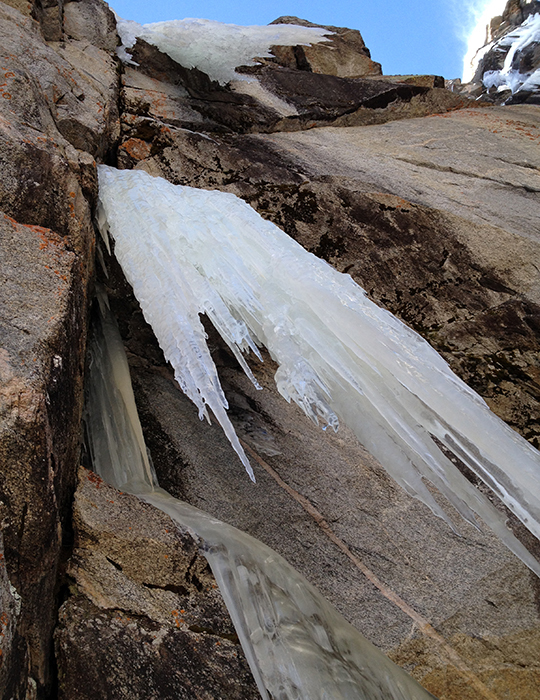 The Mount Evans area in Colorado, known chiefly for its high-altitude bouldering on coarse-textured granite, has a short but growing list of moderate ice and mixed climbs that increased by another route last week. Though the creation of new routes has been sporadic since the area's early development in the 1980s, recent interest has yielded three new climbs in the month of October. Taylor Brown and Ben Collett established Black and White (WI4/5 M5/6, 107m) and Doug Shepherd and Scott Bennett put up a 165-meter WI4 M5 called Monochrome. Just before Halloween, Collett and Will Mayo climbed a steep, pumpy, overhanging crack system that leads to a series of free-hanging ice daggers on the left side of the Black Wall. The 120-meter route they called Silhouette is now the most difficult on the wall at WI6+R M9. On a trip to Rocky Mountain National Park to climb Smear of Fear a few weeks ago, Mayo asked Collett and Josh Finklestein if they had ever come across any areas with climbable cracks and icicles in RMNP. "They both thought for a minute and couldn't come up with any recollections," Mayo said. "But, a week later I received a text from Ben indicating that he had found my route." Collett had seen it while establishing Black and White. He showed photos of the line to Mayo and the two made plans to go try it. Getting to the Black Wall requires a long approach and rappels down the northwest side of the wall to the base. "What makes this zone so wild is the commitment involved with the two-hour approach, followed by committing rappels." Collett said. "Once you are at the base of the routes, you either have to complete a [WI5] route or do a couple more rappels and make a long hike out of the cirque back to your packs, virtually guaranteeing an epic." From the base of the climb, Collett said the crux looked like it would only be WI4, "but in fact it was airy 6+." 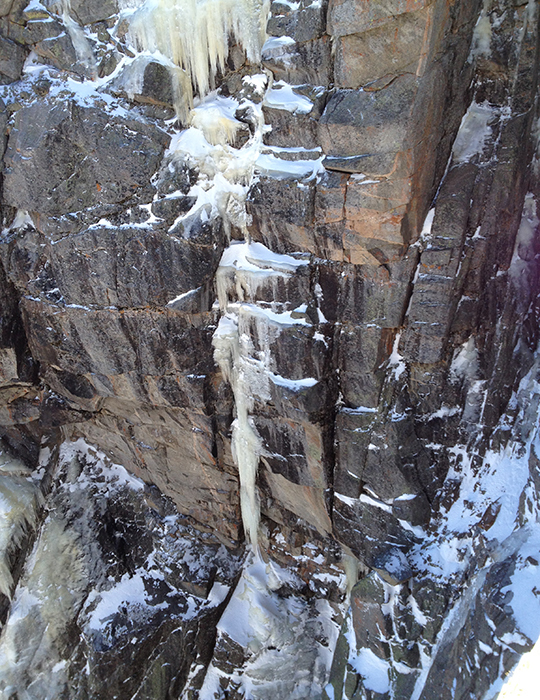 A WI3 first pitch led the two climbers to a belay below the first icicle. "The crux second pitch surmounts a difficult initial overhang by way of a verglas horizontal into a hand crack requiring pick and tool torqueing and a heel hook," Mayo said. "Once established on the verglas behind the first icicle, you traverse left on a horizontal crack to a chimney between the arete and the icicle, eventually getting into the ice and stepping up beneath the overhanging hand and finger crack crux." With good gear below him, Mayo said he was able to overcome the fear of falling and commit to the crux. But it didn't come without any surprises. "At one point, hanging above the chockstone, hooking with my left tool in the crack and working in a hand jam in a flake with the right hand, the inside of the flake started to crumble. I felt movement and wasn't sure if the entire flake, about the size of a sheet of plywood, was unstable," Mayo said. "I yelled down to Ben 'It's coming apart on me!' A plate of granite about the size of a textbook from inside the crack dislodged and fell out, miraculously making room for an excellent hand jam." Mayo finished the climb onsight, and the two climbers topped out in snowy conditions around 4:30 in the afternoon. "Looking down and inward at your last gear in the crack and knowing that you will not fall, you're safe and have succeeded, is, to me, the essence of traditional mixed climbing and absolutely the reason why I have devoted my life to this esoteric sport," Mayo said. I don't know what impresses me more, the hard climbing, the dripping dreaming line, or the ability to do such hard climbing all the while finding a two hour approach committing and 120 meter route a grade V.
I can't help, but think of some lycra clad 80's throw backs who avoided approaches to keep their leg mass down to assist with hard sends (yes many climbers have strange eating disorders/logic). Gorgeous line, stout climb, impressive hype (smiles). Amazing ascent, perfect style, these guys are definitely raising the bar! We were there a week earlier, and considered that line, but found it too intimidating. We briefly thought of rapping in, which would have been easy, but now I'm glad we left it alone. The true crushers came in and give an amazing climb the respect it deserves.